As technology gets better and better, so does everything else it touches. Lucky for you, this includes your golf game. With so much new golf technology on the market today, there’s no excuse not to improve those swings and putts! So what kind of new golf gadgets can you expect to find in 2018? And what exactly can they do to help you improve and enjoy the game even more than you already do? Well keep your golf shorts on, we’ve got just the information you’ve been looking for! Let’s look at the top 10 most exciting pieces of golf technology now available and how they can help you. Need a comfortable yet stylish watch that can do it all? Look no further than the new Garmin Approach S20. From analyzing rounds and shot distances, tracking enhanced data such as fairway hits and the number of putts per round, to tracking your steps, calories burned, and sleep patterns, this watch can do it all. Oh, and it tells time too. Handy. Learning how to develop techniques for a smooth stroke AND good tempo can be challenging. Luckily there’s a new putter now available to save the day! Flex Putter is a training aid that was designed to teach golfers exactly how to perfect their technique. Its graphite shaft flexes if it doesn’t hit the golf ball with a smooth tempo. It teaches how to properly release the putterhead. And the experts seem to love this golf gadget. PGA Tour players Fabian Gomez and Patrick Reed use it themselves. Gone are the days of ever having to lug around your golf bag again. You can now have your own personal caddy in the form of a robotic cart that will follow your every whim. The Stewart Golf X9 Follow has a ‘follow mode’ that will enable it to tag along behind you as it carries your golf bag, as long as you are walking in front of it. When you stop, it stops. And if you so wish, you can switch it to a remote control option for more customized handling. Just be sure you have the ‘follow mode’ turned off when you head down into the sandbar. The name alone kind of makes it exciting all by itself. But oh the things this golf gadget can do! The Genius Ball is a golf ball that is trackable via an app. And not only that, the app can track stats for each shot, such as velocity, carry distance, how much it rolled, spin rate, and launch angle. It will also have a map of each course you play, showing you all of your yardage. The golf ball should be available at the end of this summer. If you’re looking for a different kind of golf technology than the Genius when it comes to your golf ball, the TaylorMade TP5 Golf Ball may just be the one for you. This five-layered ball is designed to increase control, spin, and driver distance. A Dual-spin cover creates greenside control. A Tri-Fast core is made for increased velocity. And the rigid inner cover of the ball is ideal for maximizing spin generation. And what’s not to love about any of that? Ready to work on your speed and perfect your aim? This simple device is a ramp that turns your putting into an educational experience. When you putt your ball onto the ramp, the ball rolls back at the same distance it would have rolled past the cup in real life. This enables you to see just how far off your putting may be… or just how spot on you really are. And the best thing about it is, it’s portable. Take it to the office, into the next room, or on vacation with you. That way you’ll always be ready to practice that putt when the mood strikes. When wanting to improve your golf swing, adding a smart glove to the mix may just be the helping hand you need – pun intended. The Zepp Golf 2 is made up of a golf glove, an app, and a clip-on sensor. As you swing, the sensor collects data that then turns around and sends to the Bluetooth linked app. And no need to worry about practice shots ruining your data. Since impact is accessed and a pocketed smartphone can measure hip turn, only “real” swings turn into hand, club, and swing movements on the app. These stats can then be later reviewed to learn and improve from. Rangefinder meets GPS in this beautiful hybrid introduced by Bushnell this year. As players are in need of more and more data, this device combines the benefits of laser use and a GPS all on an LCD screen. By using the laser and GPS together, you’re automatically getting course recognition from front, back, and center distances, as well as distances to hazards. It also uses the same vibration-JOLT technology as other Bushnell models before it. Plus it comes with an app that identities course updates through Bluetooth technology. Nice, right? How would you like to have some comfortable shoes that not only let your feet breathe and stay cool, but are waterproof at the same time? Well, wish granted. The Ecco Cool Shoes use a Gore-Tex Surround technology that allows your entire foot to breathe, stay dry and cool even in warm conditions, all while maintaining a waterproof protection. The air channeling system is like air-conditioning for your feet. Analyzing your shots in real-time can be a game changer – literally. But now you can also turn it into competition with your friends, on and off the course! The Game Golf Live Tracking System attaches to both your club and a sensor clipped onto you. It will track your performance on how far and where every shot went. When you plot your weight into the course, the device can help you where you did well and where you can improve. Online challenges let you compete with friends and other golfers! Talk about some fun motivation. Playing better just makes your day better, plain and simple. 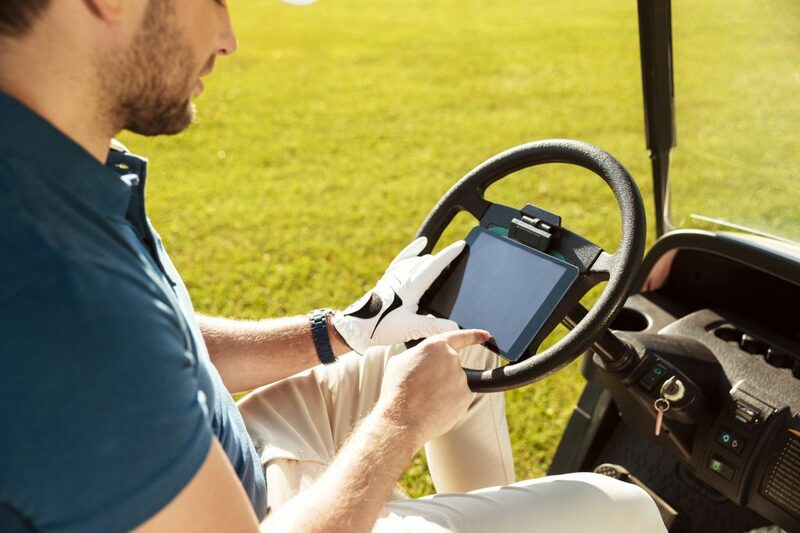 And with the new golf technology now available at your fingertips, your day just got a whole lot brighter. Now that you have new technology, want to know what the future of the game is? Click here to find out! Do many golfers mix and match brands of clubs? As a newbie, I’m hoping that the G30 driver will suit me as I bought the G30 irons and would like a matching set purely for aesthetics.